I like to eat my soup with warm, straight from the oven, bread. This dough is my favourite and so easy to amend by using different kind of flours and adding seeds, nuts or dried fruits. Whatever suits you. 1. Mix all the dry ingredients together. Don’t add all the wheat flour at once, because the dough should remain relatively soft. 2. Add the water and olive oil. Mix the batter with a woodenn spoon and add more wheat flour if necessary. Only mix the dough thoroughly, don’t knead it. 3. Cover the dough with cling film and kitchen towel and leave it in the fridge for 10 to 12 hours. 5. 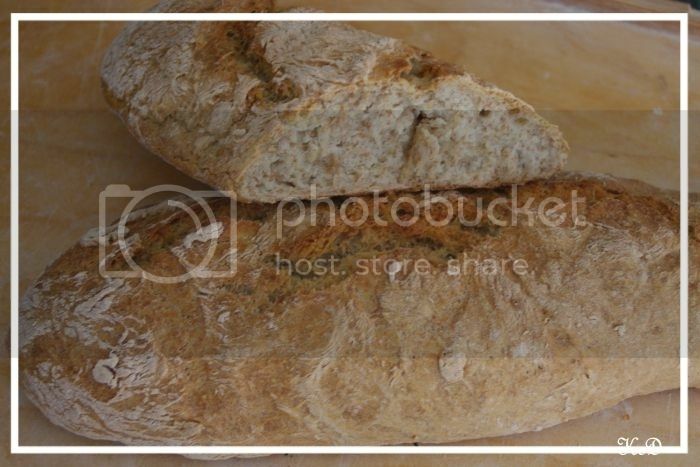 Bake the dough into two loaves (simply scoop it with a large spoon and form it with hands), slice them on top with a knife and bake them for 30-35 minutes. No need to raise the dough before baking. 6. The crust is really crispy when the bread is baked but after cooling it will be delicious. Don’t cover the breads with cloth as it will ruin the crispy crust.